The Coshocton County Retired Teachers Association was founded in Coshocton, Ohio in June 1966. It was officially renamed the J. F. Lautenschlager Coshocton County Chapter of Ohio Retired Teachers Association in September 1984. Mr. Lautenschlager was the county superintendent of schools serving from 1931 to 1957.The first meeting was held on September 28, 1966 at the Coshocton YWCA and by June 1967, twenty-eight members were affiliated. 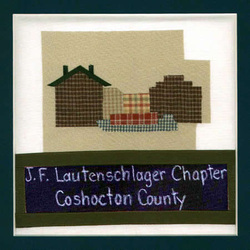 This number has grown to 114 affiliated members at present - 2007.Over the years, the J. F. Lautenschlager Coshocton County Chapter has been active in community affairs. Monetary donations have been given to "Dollars for Scholars," the Ohio Retired Teachers Association's Schoolhouse Fund and the local library. A book is donated to the library in memory of each deceased member. The chapter meetings are held the second Friday of April, June, September and December. Meetings consist of a served luncheon at one of the area churches, a local speaker of interest and a short business meeting. Following lunch a ticket is drawn for a free lunch at the next meeting. A hand bell, presented as an award in 1979, tolls to open and close each session of the chapter. Coshocton Chapter RTA members have enjoyed the company of many district directors at their meetings. The chapter has always been active in attending district and state meetings and looks forward to many more years of local, district and state affiliation. The chapter meetings are held the second Friday of April, June, September and December.